Gifts designated for LCMS Global Mission (the Global Mission Fund) are a streamlined and cost-effective way to bring people into contact with the Gospel of Jesus Christ through Word (witness) and deeds (mercy). 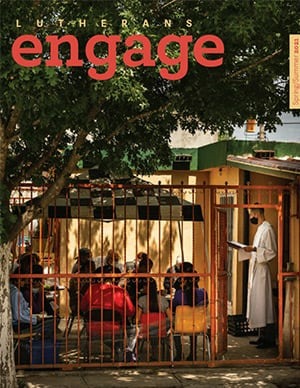 Our Synod sends missionaries, responds to catastrophic disasters, cares for the weak, champions the marginalized, strengthens LCMS congregations, supports Lutheran partner churches around the world as they are established and mature, and much more. Mercy and witness activities are no longer separated; they are carried out in close proximity to one another by one global team, boldly proclaiming Jesus Christ as Savior and showing His love for all under the banner of The Lutheran Church—Missouri Synod. Gifts for Global Mission are simple, agile and effective. Each gift is put to use wherever the opportunities are greatest at the time it is received. Global Mission gifts are put to work funding witness and mercy efforts here in the United States (National Mission) and in other countries (International Mission). 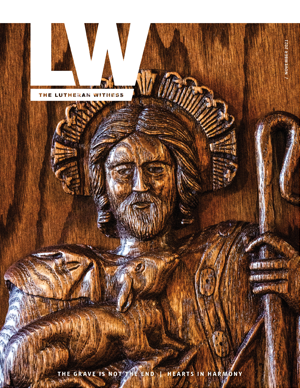 They bolster work to proclaim Jesus in Word (Witness, carrying on the work of LCMS World Mission) and in deed (Mercy, or human care in the same vein as LCMS World Relief and Human Care). Global Mission gifts also fund Life Together work, those activities intended to enhance, orchestrate and focus the tremendous capabilities spread across the entire LCMS in service to our Lord’s Great Commission. In fact the only thing Global Mission gifts cannot and do not fund is the administration of the LCMS as a corporation. Because of the way Global Mission gifts are put to work, the cost to faithfully manage and oversee these gifts runs 4.6% less than other, more tightly restricted types of donations. In fact the only type of gift with a lower true administrative cost is an unrestricted donation to the LCMS (called a “Together As Synod” gift). 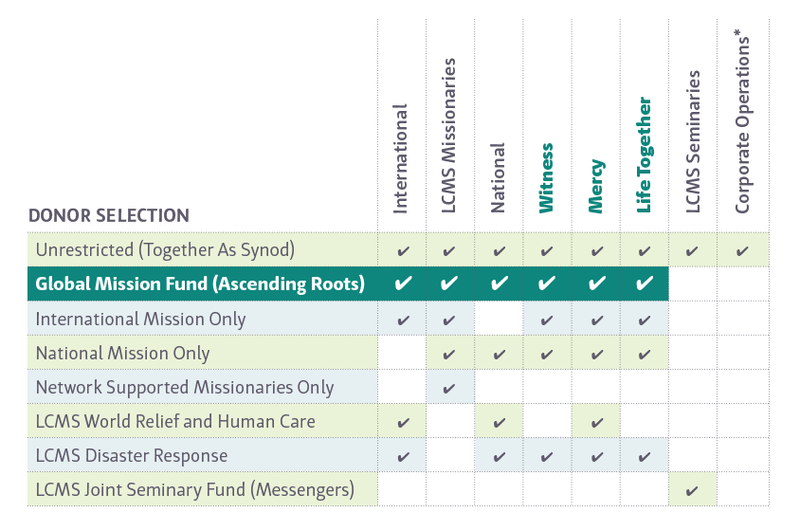 For donors not yet ready to entrust to the LCMS an unrestricted gift and yet desirous of seeing their gifts put to real mission efforts as effectively and efficiently as possible, the Global Mission Fund is an outstanding choice. As the Lord allows, please consider joining the ranks of LCMS Global Mission donors and sharing Jesus with the entire world in Word and deeds today. Text-to-Give: Text SHAREJESUS to 41444 to make a Global Mission Fund gift with your credit card or Paypal account. Give by phone: Call the LCMS Mission Advancement Donor Care toll-free: 888-930-4438. Make your check payable to The LCMS. In the memo line, write Global Mission Fund. Please do not mail hard currency such as bills or coins. For more information, or to gain answers to the questions you have about the impact of each Global Mission gift, please contact LCMS Mission Advancement at mission.advancement@lcms.org or call 888-930-4438. * Corporate synod operations includes areas such as LCMS Communications (news and information), accounting, auditing, information technologies, building operations, unfunded Synod Convention mandates, and program expenses and personnel where no other source of funding is available (including the Global Mission Fund).